We'll Get Your Door Working Like New! It’s important to hire a professional to handle your maintenance needs and to spot problems before they arise. Our technicians can perform visual inspections that cover all the moving parts that your garage door needs to function, as well as safety tests that let us know if the parts we can't see from the outside are in need of attention. We'll assess your tracks and rollers to make sure everything is still properly aligned, and take a look at the springs and cables to see if anything is wearing out. We also check your moving parts for rust build-up, which can seriously affect the door over time. Maintenance checks can spot things like a motor that is starting to burn out or if your belt drive is becoming loose. Let us help you stay on track by providing quality care for your door before worn parts become a bigger problem. Routine inspections can uncover worn chains, belts, or pulleys, reveal what parts need lubrication or tune-ups, and show us what minor repairs you need before they become major damage. Making time for a maintenance call can save you loads of time and money down the road by keeping your garage door running smoothly and anticipating the problems before they become a big issue that can ruin your day. Preventative care is the right choice for your door if you want it to remain reliable. 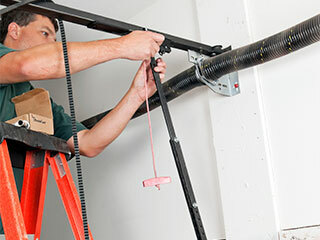 Garage Door Repair Jonesboro recommends a yearly inspection for the best results. Even with daily use, the sturdy parts are unlikely to require service more often than that, but maintenance done less often could allow wear to build up to a break. Let our trained professionals inspect your door for safety, wear, and tear, and call today to schedule your annual visit. When Should You Replace Your Garage Door Springs? Don't get lost in a sea of customers by going with some big name garage door service that's stretched thin across the state! Instead, go with one that's just nearby, with technicians ready to get to work. You can count on us to get the job done right the first time! Thank you for choosing our company! Feel free to browse our website for more information in the meantime. Our team at Garage Door Repair Jonesboro is at your service any time!